This is a refreshingly different small car that successfully blends a compact car with SUV and offers compact fuel efficacy with a surprising amount of seating and cargo space. The Nissan Juke features a full 5 seating capacity and with 5 door access you can get yourself and anything you are bringing with you in and out with ease. Its elegant outside features mirror the comfortable custom features inside as well. You get great power and control and with advanced safety features it is sure to a ride you will love. 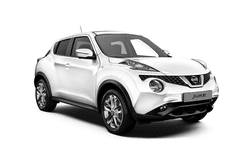 Be sure to check out the Nissan Juke for yourself and see why it is the model more people are talking about and why more people are asking for it when they need car rental services!